Na? Yes, na. 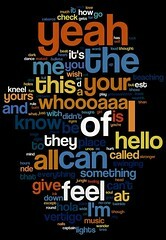 That’s a tag cloud of “Hey, Jude” by the Beatles. 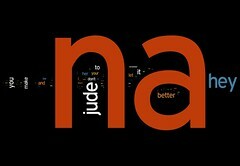 I was tinkering with tag clouds one evening last month and had the goofy urge to see what the song with more than one hundred nas at the end would look like as a tag cloud. I wasn’t disappointed. You simply can’t miss the na. Of course, hey and jude are pretty obvious, too. That prompted me to think of a nerdy little game that teens (primarily) might enjoy. Suppose people created tag clouds of various popular songs and then challenged others to guess the tune from which they had sprung. Of course, some titles are so much a part of their songs — with the key words repeated (or in some cases, hammered) into our ears so frequently — that it’s hard to miss the cues among the tags. Take the classic rock song from the ’70s shown at right. That title is probably easy to pick out. Or the (mostly) instrumental marching band anthem from the 1960s [left]. 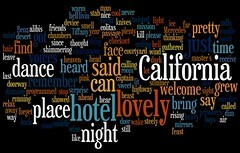 Its one word tag cloud is surely the simplest ever. But we can make this game more challenging! See if you can pick out these next two songs. You can click through to larger versions on my Flickr page if that would help. One song came from a major rock band and the other is a tune from an “American Idol” contender. If you have a teen group in your library, let them pick the songs (remembering, of course, that not all lyrics have PG ratings! ), give them the tools*, and let them create their own tag clouds. If you want to add a scoring element, you might award 20 points for the correct song + 10 points for the singer + 10 bonus points for guessing both within 30 seconds. Hang the tag clouds on the wall after they’re solved. The song was already musical art. 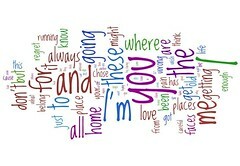 Now the words are visual art! I’ve created more than a dozen musical tag clouds already. You can find them in the Musical Tag Clouds set on my Flickr page. If you (or your patrons) create* more, post them to Flickr and tag them “MusicalTagClouds”. There’s also a Flickr group with the same name. Toss in a hint if you think it’s warranted. Over time, our global collection could grow incredibly large and varied. The images would be available for a solo challenge or a classroom game at the drop of a hat. How fun it will be to randomly choose among them and try to guess the songs. This entry was posted on Tuesday, July 15th, 2008 at 8:47 pm and is filed under social web, tools. You can follow any responses to this entry through the RSS 2.0 feed. You can leave a response, or trackback from your own site. 6 Responses to Musical Tag Clouds: A New Game? What fun! I want to play (although I know I’d be terrible at it…). …but it would be fun to put these on display for some of our more enterprising audiophiles. I hadn’t yet stumbled upon Wordle yet, Steve. Thanks! I love this! Truly beautiful and very clever.